Air Force Captain Anthony Simone graduated from Embry Riddle University before enlisting in the Air Force, and then going to Officer Training School (OTS) and flight school. He flew HH-60G Pave Hawk helicopters, designed for Combat Search and Rescue. On June 9, 2010, Capt Simone was the co-pilot of a helicopter with the 66th Rescue Squadron on a mission to pick up several wounded British Soldiers when the helicopter was shot down near Sangin Helmand Province, Afghanistan. With little control of the spinning helicopter, Capt Simone was somehow able to steer to an area away from the prepared Landing Zone, no doubt saving lives on the ground. Capt Simone, one of two survivors in the crash, sustained a severe traumatic brain injury (TBI). Initially treated at a local field hospital, Capt Simone was airlifted to Landstuhl, Germany before being transported stateside. Spending 6 weeks in a coma, Capt Simone’s hospital and recovery journey has taken him to Brook Army Medical Center in San Antonio, TX, the James Haley VA in Tampa, Bethesda National Naval Medical Center, the Rehabilitation Institute of Chicago, and eventually the Hines VA in Illinois. Captain Simone enjoys spending time with his wife, Andrea, and their two young children. He enjoys archery and attends weekly meetings with the Joliet Archery Club. He has also taken up cycling. 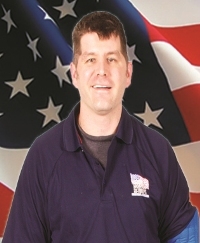 Tony has always wanted to help others and hopes to one day work with injured Veterans who are experiencing challenges. A native of Pennsylvania, Tony has set his roots down in Andrea’s hometown and is an active member of the VFW and the American Legion, enjoying the camaraderie of his peers and a local support network.